This drought-tolerant, sage-like plant attracts butterflies with its bright flowers, which also make great cut flowers in bouquets. Jerusalem Sage forms a large mound of wooly leaves, with whorls of butter-yellow flowers skewered in tiers on long spikes. The velvety leaves have a sage-like appearance, but lack the aroma and taste of true sages. Butterflies and bees are attracted to the flowers, adding good habitat to your yard. Flowering may be extended throughout the growing season if stems are cut back promptly after flowering. The cut flowers make nice bouquets, and after the flowers fall away, the seedpods create interesting dried arrangements. Flowers allowed to go to seed attract songbirds in fall and winter. 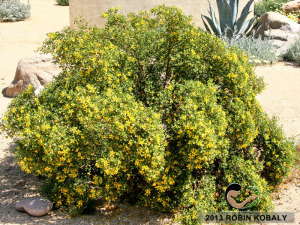 While this drought-tolerant shrub tolerates some shade, it may get leggy with too much shade. Jerusalem Sage makes a good accent or specimen plant, but it also works well in borders and containers, or massed in the garden. This sturdy favorite of cottage gardens offers a blanket of pink flowers in spring, cheering up any sunny space it fills. 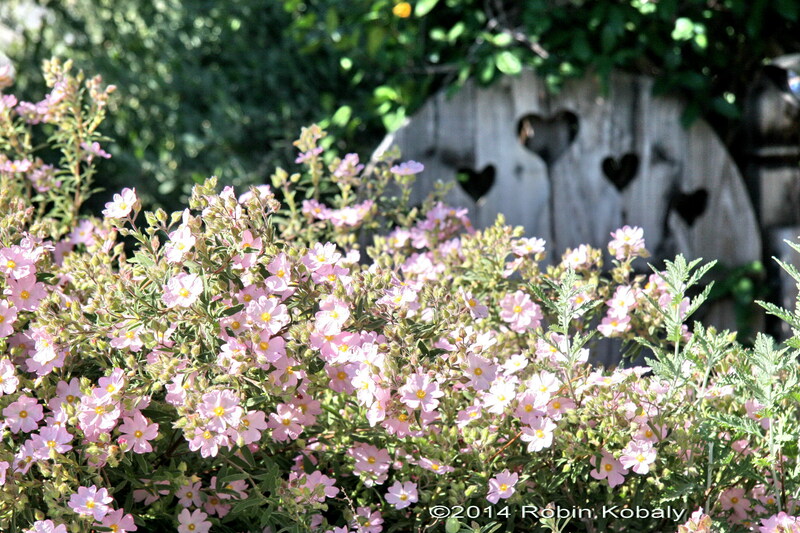 A charmer in informal cottage gardens, this sturdy Mediterranean shrub is blanketed in spring with pale pink, one-inch flowers with yellow centers, offering a lighter smattering of flowers in summer and fall. This low-maintenance shrub tolerates heat, wind, drought, and poor soil, resists the advances of deer and rabbits, and requires only occasional irrigation after established. 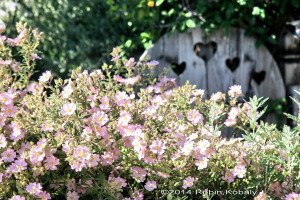 Pink Rockrose likes full sun and well-draining soil. Give a light, overall shearing or pinch off tips of young plants for thicker growth, pruning dead wood in early spring, but know that this shrub resents hard pruning. Useful as a dry-bank cover, informal screen, low divider, for erosion control on hillsides, along drives, massed by themselves, or planted among other shrubs. This very satisfying plant looks great alongside other shrubs like lavender, rosemary, sages, and buckwheats, and also works well in pots. This truly superb penstemon will catch the eye of hummingbirds, spinx moths, bees, you, and all your visitors. This guaranteed hummingbird magnet is absolutely stunning when tall spikes of vivid coral flowers rise 4 to 6 feet above a rosette of large, blue-green leaves. The eye-catching flowers also attract bees and sphinx moths (often mistaken for hummingbirds), and its seeds attract songbirds. Plant in fall for spring flowers. Remove spent flower stalks and give some supplemental summer water to extend flowering. To take advantage of its tendency to self-seed, wait to cut some flowering stems off at the base until after seeds are sewn. This herbaceous perennial lives for 3 to 5 years. Re-seed at least every two years to keep new seedlings starting as older plants die out. This delightful perennial, also known as Superb Penstemon, grows well in full sun or filtered shade in well-draining soil. Coral Penstemon looks great behind lower shrubs and perennials for a layered effect. 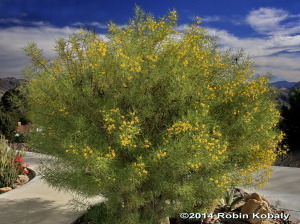 Masses of yellow flowers cover both Feathery and Desert Cassia when flowers are scarce in winter; both plants are extremely tough and drought-tolerant. 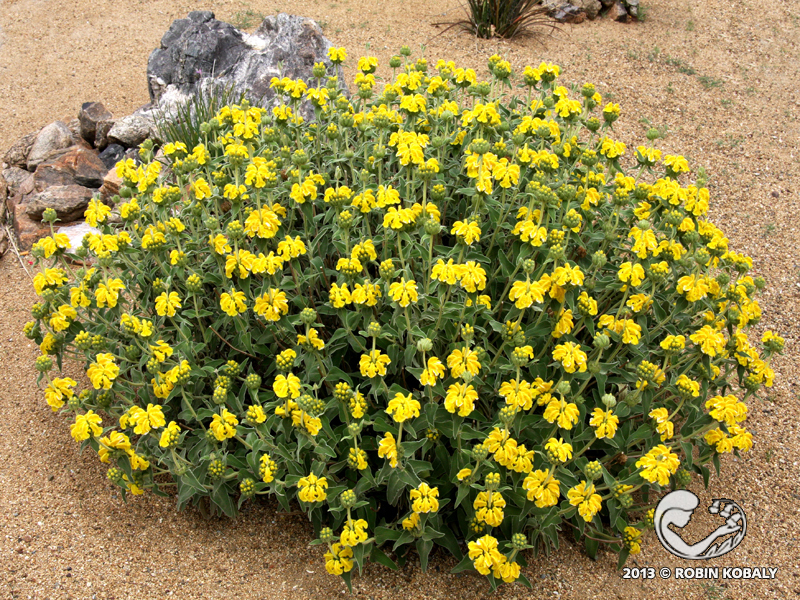 When flowers are scarce in the middle of winter, these two Cassias burst out with masses of fragrant yellow flowers, and steal the show in Southwest landscapes. Both Feathery and Desert Cassia (bush pictured here) survive on minimal water, but respond with more lush growth and more flowers with a little added water (too much water causes yellowing). Feathery Cassia’s silvery sheen adds interest in the breeze. 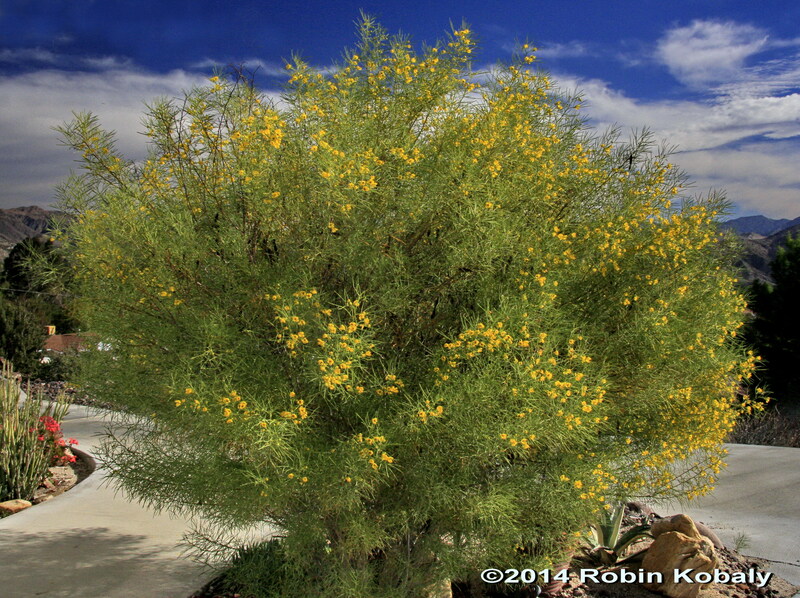 Desert Cassia’s narrow, bright green foliage bestows its other name, Green Cassia. Pea-like flowers create lime-green seedpods which later darken to brown; pruning in late spring removes these pods for a tidier look (avoid pruning after July, or you’ll remove flower buds that start forming in August). These extremely tough plants can be used interchangeably as a great background plant, as contrast for darker green plants, massed in groups, or to complement succulents. Hollyleaf Cherry can be trained into an attractive tree, sculpted into a hedge, or left in its natural form for evergreen beauty. 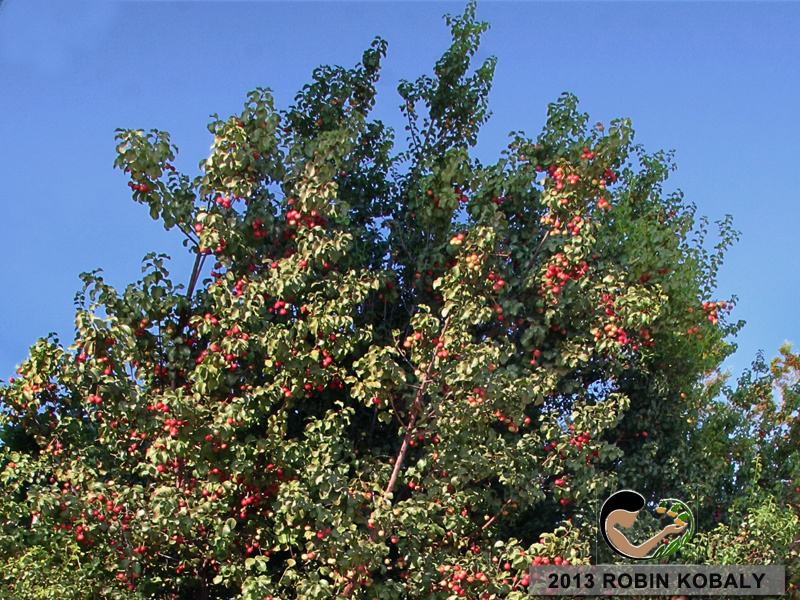 It’s edible summer cherries are a magnet for songbirds. Hollyleaf Cherry is a tightly-branched, long-lived, evergreen, shrub with lush, deep green, glossy leaves that have an almond-like scent when crushed. White flower clusters in spring produce dark red cherries in summer that are a favorite of songbirds. 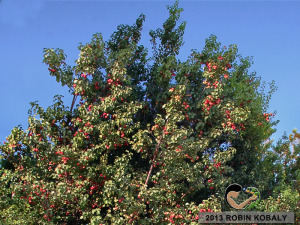 This easy-to-grow plant can be trained into an attractive tree, or sculpted into a variety of shapes and uses. Hollyleaf Cherry is ideal for screens, hedges, windbreaks, firebreaks, for erosion control on slopes, or as a specimen plant. While slow-growing the first few years, it reaches moderate to rapid growth after established. Although this cherry relative bears its flowers in spring and fruit in summer, we couldn’t resist featuring this beautiful shrub in winter, as its holly-like foliage is a favorite for Christmas wreaths and holiday decorations. Creosote may be among the least appreciated but most valuable landscape plants in the Southwest. 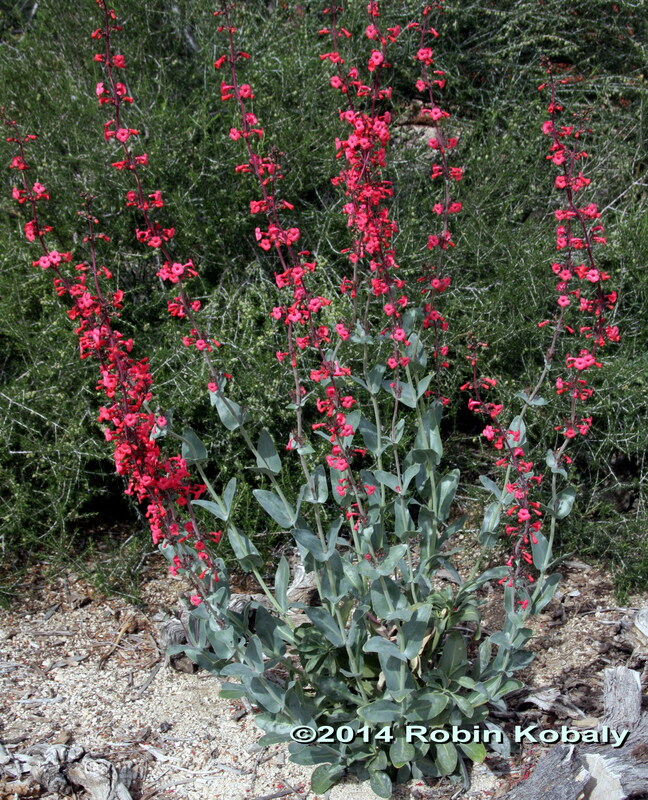 As perhaps the most drought-tolerant plant in North America, it will thrive in your yard with just occassional water, producing flowers most of the year. 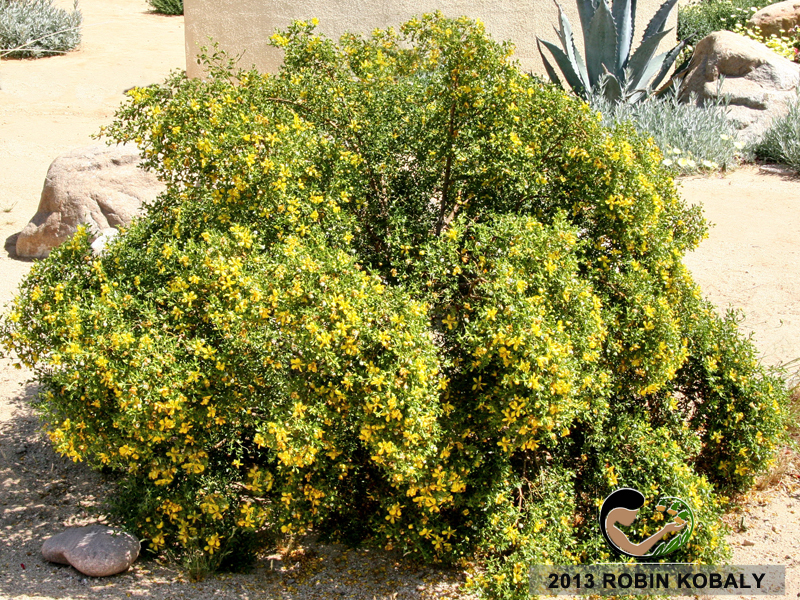 Creosote survives on its own in the hottest, driest deserts of the southwest US, but when invited into a landscaped setting, this open-branching plant will surprise you as it will become a more full, rounded shrub with dense foliage. Sometimes called greasewood, this very long-lived, aromatic shrub is what gives the desert its distinctive smell after a rain. Lemon yellow flowers or fuzzy white seeds may appear most of the year, although Creosote blooms most profusely in spring. 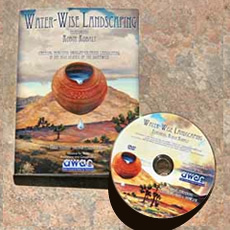 Although it needs no water after its established, extra summer water will speed up growth, but overwatering or fertilizer will kill it. Creosote can be pruned into a multiple-trunk, tree-like form, or trimmed like a hedge to stimulate denser branching and more lush foliage. A great evergreen screen or border hedge, or as an accent for xeriscape and cactus gardens.